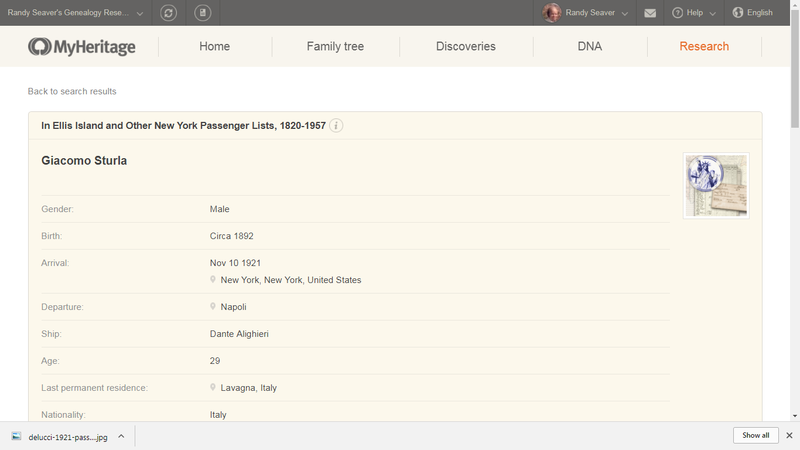 I was curious about the "Unique Content" in the MyHeritage collection of "Ellis Island and Other New York Passenger Lists, 1820-1957" that was announced last week. "As of 1897, immigration officials began asking those entering the United States for the name and address of the relative or friend whom they are joining in the USA, and in 1907 they began asking for the name and address of their closest relative or friend in their home country. The responses to these supplemental questions, that have been filled in the passenger manifests, have now been indexed by MyHeritage for the very first time, yielding an additional 26.6 million names in the Ellis Island and Other New York Passenger Lists collection on MyHeritage. These passenger manifests have been digitized by other organizations in the past, but the answers to these vital supplemental questions have never been indexed — until now. Furthermore, many of the passenger manifests span two pages, and a common omission for genealogists has been to locate the first page and miss the existence of the second. 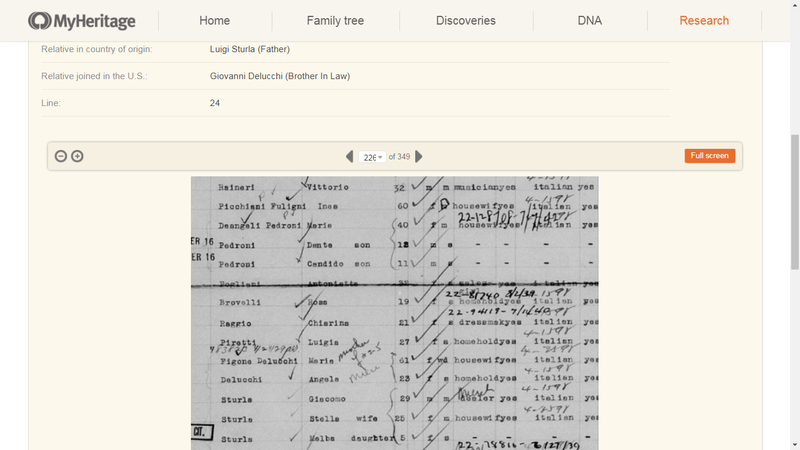 MyHeritage has solved this problem for the first time by stitching the double pages into single document images, ensuring that users do not miss information again." Here you can see that MyHeritage has stitched two pages together so that a researcher won't forget to find the second page..
* on Line 22, for Maria Figone Delucci, there is a handwritten note "mother of #25." #25 is her daughter, Stella (Delucci) Sturla, the wife of Giacomo Sturla. * The birthplace information for Stella (Delucchi) Sturla is San Francisco, Calif., so this isn't the first visit to America for the Delucchi family. Giacomo Sturla was born in Lavagna, Italy. * Another column for Maria (Figone) Delucchi indicates that she has traveled to the USA in 1880 and 1920. Giacomo Sturla has traveled to the USA in 1907 and 1919. * Giacomo Sturla's height was 5 feet 7 inches and his hair and eyes were chestnut, and his wife Stella was 5 feet 6 inches and her hair was fair and her eyes brown. The mother-in-law, Maria Delucchi was 5 feet 5 inches, with grey hair and grey eyes. The enhanced indexing may enable researchers to find persons they previously not found - for instance, you can search without a name and with an Italian town name, or the name of a relative in the country of origin. Disclosure: I have a complimentary MyHeritage Data and Tree subscription, and have received material considerations from MyHeritage over the past eight years. However, this does not affect my objectivity in discussing and analyzing the MyHeritage products. This could certainly come in handy. Thank for sharing this Randy. I have never used My Heritage records. I have uploaded my DNA and other family member's DNA to their site, but that’s about it. Maybe a two week trial would be worth a go just for the passenger lists alone?